← It’s Giveaway Time! Who Wants to Win a Free Wrap or Ring Sling?! There are few things sweeter in my life than having my son sleeping nestled up against my chest. The beat of my heart and rhythm of my step lulls him peacefully to sleep every night. I cherish this time in our lives, because I realize all too well that the moments are fleeting, and before I know it I will be watching him grow into a more independent child. This picture represents our relationship with babywearing. It has been a constant source of comfort for the both of us. Babywearing has aided us in creating an amazingly strong bond, which I am forever thankful for. I snapped this picture of us on a day that was particularly trying. My son was getting both of his front bottom teeth in at the same time, and neither of us were getting much sleep. He was having a terrible time trying to nap, but after about half an hour of swaying and dancing around the apartment, my son wrapped up against me, he finally lost the battle with sleep and peacefully drifted off. Each time my son falls asleep like this on me, I swear my heart is about to burst with joy and love. This particular moment I was almost brought to tears, overpowered by the sense of love that only a mother can feel for her child. 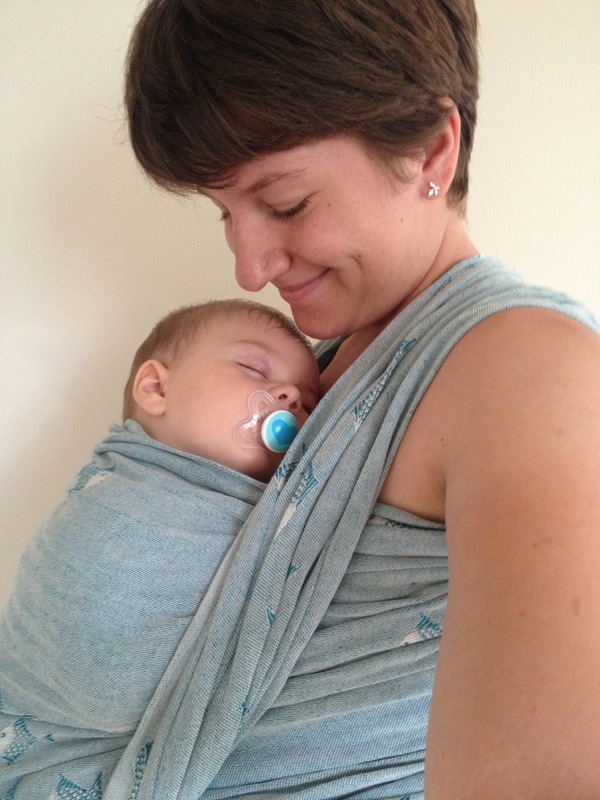 The wrap I am wearing is a didymos mystic fish, it is a lovely linen and cotton blend wrap that has continued to provide us peaceful moments like this one.